“Childbirth–in general–is a very exciting process, but there’s a lot of uncertainty involved.” That’s how Michael Menth recalls the birth of his son Miles, following a premature and traumatic delivery. Michael’s wife Miranda experienced a very typical pregnancy for the most part. 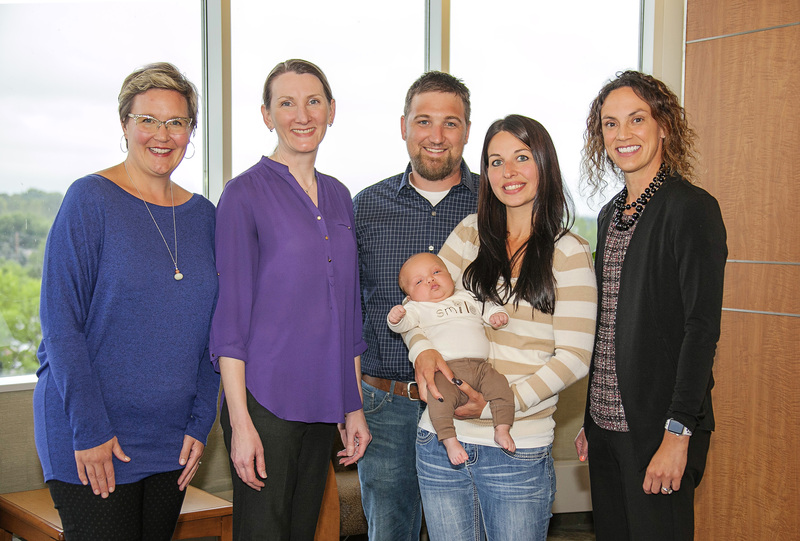 “She had a completely uncomplicated and healthy pregnancy right up until she didn’t – until it suddenly became high risk,” explained Rebecca Baudoin, MD, Western OB/GYN, A Division of Ridgeview Clinics. Miranda’s water broke late one evening and suddenly she was delivering her baby six weeks early. To complicate matters further, the baby was sideways so the decision was made to deliver by C-section. “They [Ridgeview team] walked me right through it, gave me an epidural and right after, it felt like minutes, and he was out. I got to see him briefly and give him a little kiss.” Baby Miles was rushed to Ridgeview’s Neonatal Care Unit (NCU), where he would stay for nearly three weeks. Ridgeview’s partnership with Children’s Hospital and Clinics of Minnesota brings expanded care for the most fragile of infants. Children’s provides neonatology services including a neonatal nurse practitioner that’s in the NCU 24/7. Families in Ridgeview’s communities can receive NCU care in Waconia rather than driving downtown to Minneapolis. Specialized care and support for infants is also provided by Ridgeview’s lactation specialists, respiratory therapists, nutritionists, pharmacists, rehabilitation staff and more. Ridgeview’s Neonatal Care Unit features seven private rooms with the capability to care for up to 13 infants at a time. The unit includes a family lounge with a private consultation area, computer with Internet access, kitchenette and sitting area all in a secure are in the hospital. In addition to the care available, daily email messages from Ridgeview’s NCU to parents of all NCU babies are among the reminders of how something so small can have such a big impact on their lives. Written as if they’re coming from the infant, the messages are generated through a software call CribNotes, an electronic medical record and database management system designed specifically for Neonatal Intensive Care Units. The email messages update parents on their little one’s health–weight gain or loss, reliance on oxygen and feeding information, for example–and include encouragement and heart-warming comments that help parents feel connected to their babies, even if they’re not with them 24/7. Learn more about Ridgeview’s Birthing Center and NCU at Ridgeview’s website.